In line with the Thai government’s Thailand 4.0 policy, the Board of Investment (BOI) in Thailand is establishing a Strategic Talent Centre (STC), to enhance the availability of required manpower in the fields of science and technology, especially for the 10 targeted S-Curve industries. 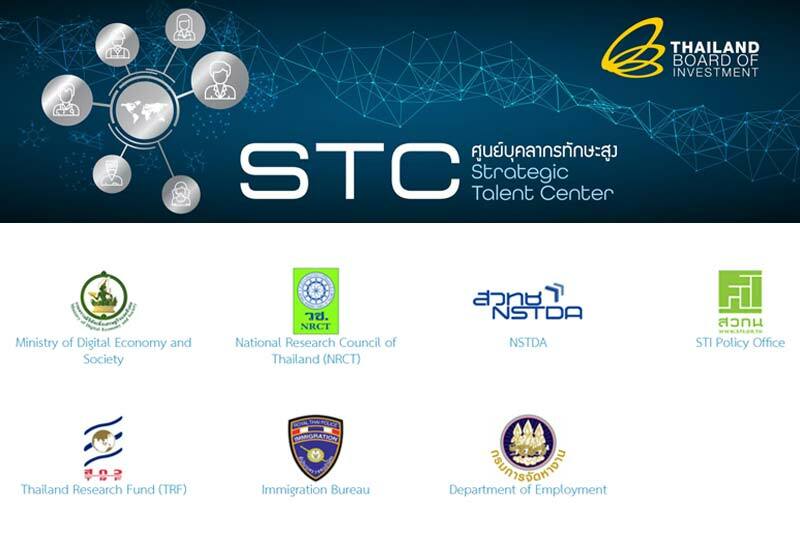 BOI is collaborating with five other government bodies to form the STC network: the Ministry of Digital Economy and Society, National Research Council of Thailand (NRCT), National Science and Technology Development Agency (NSTDA), National Science Technology and Innovation Policy Office (STI), and the Thailand Research Fund (TRF). The Immigration Bureau and the Department of Employment, Ministry of Labor are also involved in the initiative. The STC provides services for identifying available specialists or researchers in the fields of science and technology (S&T), thereby supporting the private sector in conducting R&D and innovation activities. A leaflet on the STC explains the procedure. Thai companies or foreign companies in Thailand looking for S&T manpower to support their operations and investment can submit their requirements on the STC’s website, www.boi.go.th/stc. Following submission, the information will be transmitted to the five agencies in the STC network. These agencies will search for the required experts in their extensive databases and will produce a list of suggested experts, whose profiles will be sent to the requesting companies for further engagement. The databases used in the search cover both existing researchers/experts working in the public sector who could be mobilised to work in the private sector and an available pool of new PhD graduates with research experience in Thailand or overseas. STC also offers a mechanism for recognising the qualifications of foreign experts who wish to live and work in Thailand, as foreign experts may be required to mitigate the shortage of local expertise in certain areas. The recognised foreign experts can have access to special arrangements for visas and work permits. Again, companies apply via the STC website on behalf of the foreign experts they wish to bring into Thailand. STC sends the data on the foreign experts to the relevant authority for consideration, within 2 working days. Relevant authorities in the STC network could be the Ministry of Digital Economy and Society for IT experts and the Ministry of Science and NRCT for S&T experts. The relevant authority reports the results of their consideration to STC within 20 working days. STC registers the data on the recognised experts in their database and notifies the companies. The recognised experts receive visa and work permit facilitation regardless of working in a BOI-promoted company or not. Using support document issued by STC based on company request, the experts can apply for a non-immigrant visa from Thai embassy/ consulate. Subsequently, companies submit an online application to STC for bringing in the recognised experts. STC approves the application and notifies the Department of Employment and the Immigration Bureau (this will be automatic from October 1, 2018) and the experts present themselves at the One Stop Service Center for Visa and Work Permit within 15 days after the approval date to receive a work permit and visa extension. “As we realize that human resources will play a vital role in moving Thailand forward, we at the BOI are looking at the comprehensive array of factors supporting investments in Thailand, not just tax incentives. STC is one step that we are taking to provide investors with better and more comprehensive services. The improved mobilisation of science and technology manpower will certainly contribute to the implementation of Thailand 4.0 policy. We are glad that our STC will play a significant role in this jigsaw puzzle and help investors optimize their opportunities here,” she added.